New Merck, Reviewed | A "New Merck" Review. . .
That is flatly untrue, on the decentralized Bitcoin exchanges, or the DEXes, for short. Mnuchin is willfully blind here. Gee… I wonder… why? In any event, here is the main bit of the story: Bobby Three Sticks was able to track at least some of the GRU (Putin-approved) hackers… in part, via the emails they left, and their identifying characters, in the blockchain, as they themselves exchanged payments for illicit services. 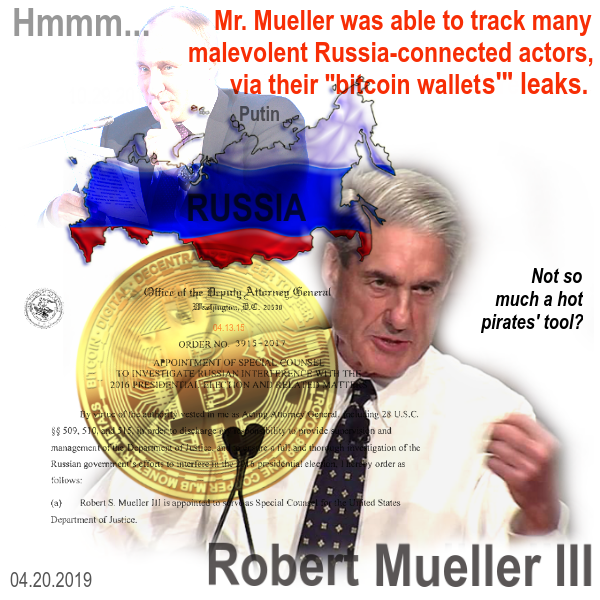 Precious.
. . . .Within the [Mueller report], a small section details bitcoin’s role in bankrolling the Russian government’s cyberwarfare endeavors. A sub-unit of one of these two subdivisions ran “a bitcoin mining operation to secure bitcoins used to purchase computer infrastructure used in hacking operations,” the report states. Others ran “spearphishing campaigns” or developed specified malware to gain access to DNC hardware and data. . . . When asked at the Economic Club of Washington in January 2018 whether or not such activity is a cause for concern, U.S. Treasury Secretary Steven Mnuchin affirmed, “I don’t think that’s a concern,” adding that cryptocurrency exchanges are held to the same KYC regulations as banks. . . .
That is — most-charitably construed — an idiotic, off the cuff opinion. And it is more than equally likely — Mnuchin holds it, with a darker purpose, beneath. Just a brief note here (with more some other day, when I am not pressed by family matters), on an important Ninth Circuit decision just handed down — one argued last year. This is our first formal mention of this case. Unsurprisingly, the Ninth Circuit just confirmed this morning — in a 54 page opinion — that the State of California retains the right to supervise, and in some cases, regulate the treatment of humans within the state’s borders, regardless of their documents. So long as the state doesn’t impose new economic burdens on US Border Patrol, and ICE, California may also require certain minimum standards for housing people picked up along the southern border — standards it may impose upon the feds, inside California, at least. Now you know. Go. . . be better to one another, than you really need to be. . . . This is the slightly delayed overnight order, on a shortened schedule for a new status update hearing next week, and a directive that Commander White, in person, attend the coming settlement discussion session, as ordered. That’s an unusual order — and it suggests waning judicial patience. I think he enjoys an ongoing presumption of credibility, and good faith — from the able Judge Sabraw, based on his earlier appearances. [He has been in his current role since long before Donald Trump took office.] And it seems clear — in between the lines here — that the able judge will not accept a two year time frame to identify the remaining perhaps 47,000 children who are separated from their families, or otherwise. . . missing. It is my estimation that the judge expects Commander White to press hard on an accelerated urgency, and decency, out of Team Trump’s lawyers, in trying to minimize these unspeakably monstrous, and still-ongoing. . . harms.
. . . .On the newly added class members, the parties shall meet and confer on a joint proposal for identifying the children of the newly added class members. The meet and confer should preferably take place in person and should include, at a minimum, Commander White for Defendants, and a representative for Plaintiffs, not just counsel for the parties. As part of the meet and confer, counsel and the parties should discuss methods of expediting the review process for children who were in ORR custody between April and June of 2018, any young children who were unlikely to have crossed the border alone and any children who were apprehended in the El Paso Sector during the relevant time-frame. . . . Depending on the status of the meet and confer efforts, the Court invites the parties to submit a short status report to the Court outlining any areas of agreement and disagreement between the parties. If the parties are able to submit that report, they should do so on or before 5:00 p.m. on April 23, 2019. A further status conference on these issues shall be held on April 24, 2019, at 1:00 p.m.. . . .
Now you know — celebrate or refrain, as you see fit — one and all, this weekend. And be thankful that your family, whatever that means to you — is not ripped asunder this holiday — by unlawful governmental edicts. Me? I plan on. . . downing a huge Easter brunch (sushi array, along with omelets, waffles and rare prime rib. . . at our extended family’s favorite high-end hotel haunt). . . along with new baby girl, and youngest son, in tow. . . smile. Onward. UPDATED 04.19.2019 @ Noon: This is. . . appalling. 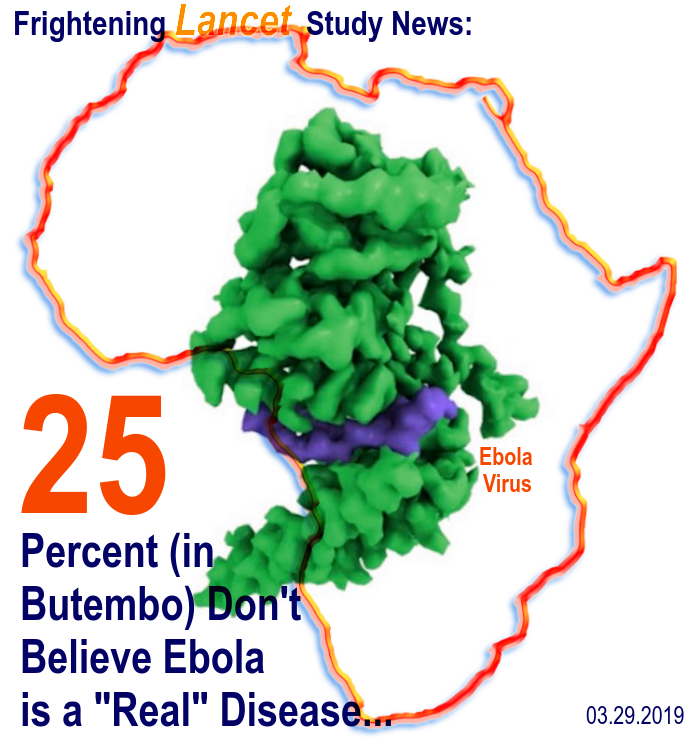 A doctor (from the Cameroon) providing care to ebola patients, was murdered in Butembo overnight — at that city’s MSF ebola treatment center. Other health workers and patients were wounded in the attack, but there is going to be a shortage of Doctors Without Borders volunteers, if this persists. Depressing. End update. Honestly, I cannot bear to write of it. 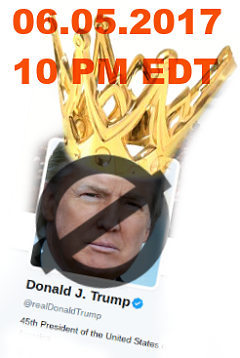 Not tonight. So much bad news — too much for one week. Do read CIDRAP, on it. And tomorrow, at some point in the late afternoon, we will know just a few of the many, many ways the sitting president has betrayed his oath of office — and all of us. William Barr Lacks The Power To Overrule An Express Federal Court Ruling, By “DoJ Edict”. He Must Appeal In The Courts. First, the basics: Flores, and the cases after it, clearly set out very short time frames for the vast majority of asylum-seeking detainees — to be released.
. . . .The Barr ruling — which [purports to] direct immigration judges to deny some migrants a chance to post bail — will not go into effect for 90 days. It is all but certain to be challenged in federal court, but immigrant rights lawyers said it could undermine the basic rights of people seeking safety in the United States. “They want to send a message that you will get detained,” said Judy Rabinovitz, a deputy director of the Immigrants Rights’ Project at the American Civil Liberties Union. “We are talking about people who are fleeing for their lives, seeking safety. And our response is just lock them up?”. . . . 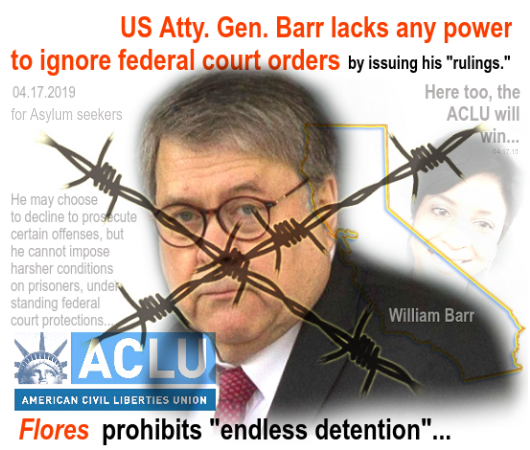 The ACLU officially tweeted last night, in California, it will see Mr. Barr’s people “in court” shortly. And the ACLU will prevail, Condor predicts. Onward, grinning. There were important developments at another watershed hearing, this afternoon, in litigation involving another aspect of the ongoing Trump crime-sprees, against common human decency (the Ms. L. settled injunctions against his anti-immigrant vendettas — ripping kids from their families). At the telephonic status hearing before the able Judge Sabaw in San Diego this afternoon, the ACLU and other plaintiffs’ lawyers laid out with specificity (as they said they would last Friday) the main ways in which the Trump administration is evincing sneering disdain for kids ripped from their parents (wholly unlawfully, it turns out). . . . .[T]he government proposes a plan that would (1) allow an initial three months just to build a statistical model to prioritize the order in which the government will review files, and then (2) give the government another 21 months to review the files. Everything about the plan is flawed. First, a list of separated children already very likely exists for children who were separated from their parents and released from ORR custody between April and June 26, 2018. This is because the government began assigning Family Unit numbers in April of 2018, enabling CBP to track families that were separated. By cross-referencing CBP’s list of separated children with ORR’s list of children released from ORR custody, the government could immediately identify the separated children it released to sponsors between April and June 2018, assuming that list does not already exist. That would immediately reduce the number of cases the government has to review. It is a serious breach if that list does in fact exist (or could have been immediately generated) and has not been mentioned by the government. Second, even if the government must review all the cases for the full period at issue here (July 2017 – June 26, 2018), the government should be able to perform this task in three months or less based on its past practice during the initial reunification period last summer. Yet the government wants three months just to create a statistical model before even beginning to review any files. . . .
[Astonishingly,] the government is proposing to look only at a computer portal maintained by ORR. Dkt. 394-2 at ¶ 9. But those portals contain only a portion of the case managers’ paper files and frequently will contain no information about whether or not the child was separated. . . . Ultimately, the government is simply refusing to prioritize the welfare of these children and families. The government initially argued that it should not even have to identify these families. Now it has submitted a plan that shows little regard for them and certainly not the urgency warranted where the lives of young children are at stake. The process of identifying the victims of the government’s separation policy is the first step to ensuring that no child is permanently orphaned. . . .
Now you know — and there could be. 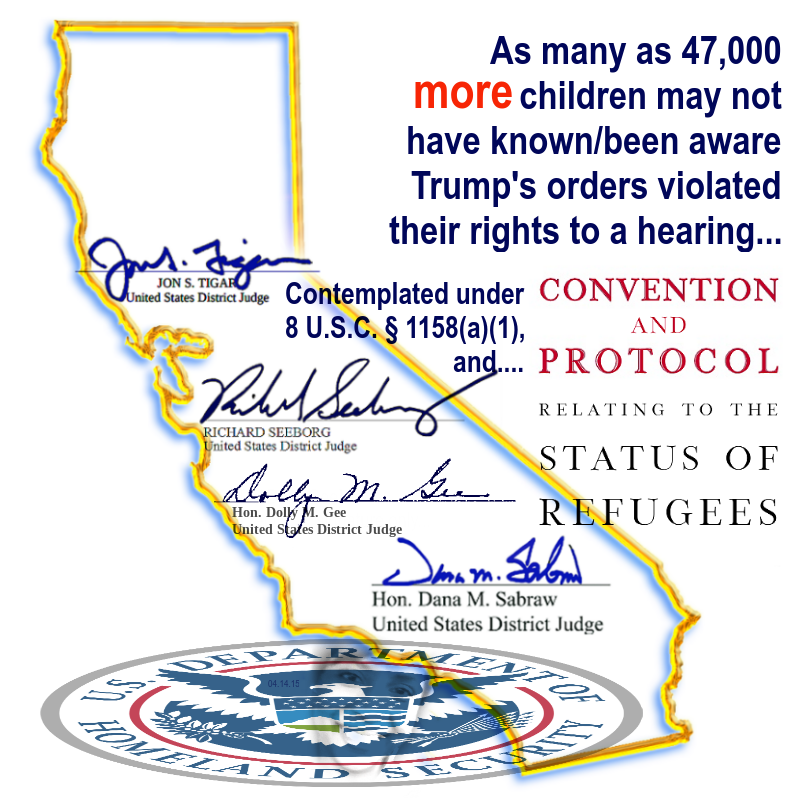 . . up to an additional 47,000 of these children. What is wrong with Trump-hive-mind? I’m off grid for the night — to cool off. . . . .[Team Trump is] unlikely to prevail on their merits arguments on appeal. The district court held that Plaintiffs are likely to succeed on three separate claims: 1) that Defendants are unlawfully applying the forced return policy to a population Congress expressly exempted from contiguous territory return — individuals who arrive at the border without proper documents, who are often seeking asylum, and who are subject to “expedited removal” proceedings; 2) that the forced return policy is arbitrary and capricious in violation of the Administrative Procedure Act (“APA”) because its fear determination process for determining if individuals can be safely returned to Mexico dramatically departs, without explanation, from prior practice and virtually ensures that noncitizens who face persecution or torture in Mexico will be returned there in violation of our non refoulement obligation; and 3) that Defendants violated the APA by adopting the new fear determination process without undergoing notice and comment. Because Defendants have not shown they are likely to prevail on each of these claims, they are not entitled to a stay. Second, Defendants have failed to demonstrate that the balance of harms favors a stay. They offer conclusory assertions that the injunction will hinder their diplomatic negotiations and efforts to deter unauthorized migration at the border, but provide no concrete evidence of any irreparable harm. In contrast, as the district court correctly found, “there is no real question” that the Individual and Organizational Plaintiffs face “the possibility of irreparable injury.” Op. at 24. Moreover, the injury to Plaintiffs and the harm to the public interest will increase exponentially as Defendants expand the policy. Finally, the nationwide reach of the injunction does not warrant a stay. There is no other way to provide a remedy to the Plaintiff Organizations. . . .
Onward, warm and sunny here — off to go hunting my favorite taco truck, on foot. You know we need more of this — not less. Bring the asylum-seekers to Chicago. We have ample room — and open hearts — to handle it all. We always have. They will be welcomed here. This will be entirely rewritten tomorrow, around Noon Eastern, when the first brief is filed, in Innovation Law Lab v. Nielsen, et al. (Appeal No. 19-15716), Ninth Cir. This concerns whether Trump may drive people awaiting 8 U.S.C. § 1158(a) hearings (on “credible fear“, among other matters), back across the southern border, and leave them in Mexico, until their hearing dates. I think the law is clear that he cannot. 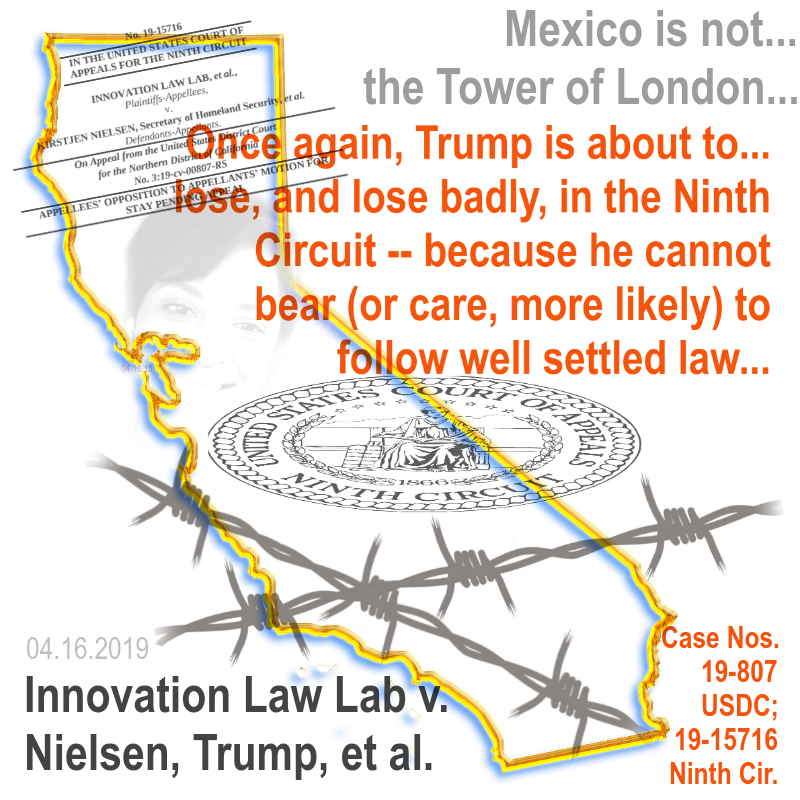 The nationwide preliminary injunction is on appeal in the Ninth Circuit — and we will start to see that play out tomorrow.
. . . .The court has received appellants’ emergency motion for a stay. 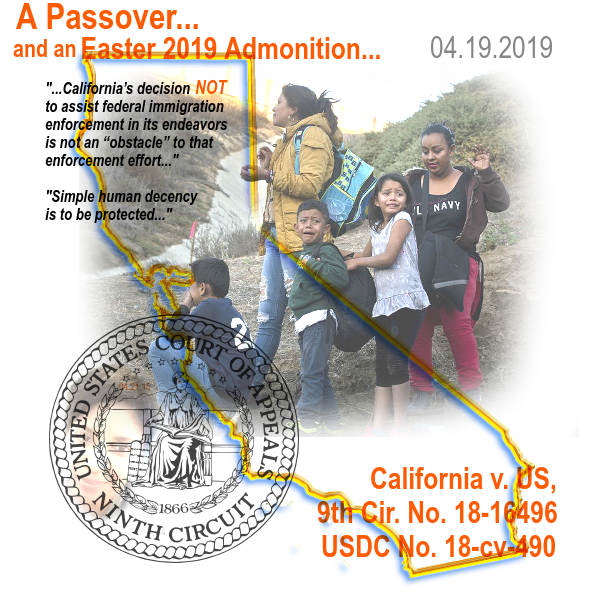 The district court’s April 8, 2019 preliminary injunction order is temporarily stayed pending resolution of the emergency stay motion. The opposition to the emergency motion is due at 9:00 a.m. Pacific Time on April 16, 2019. The optional reply in support of the emergency motion is due at 9:00 a.m. Pacific Time on April 17, 2019. [Erh, more to come]. . . .
Onward — on a brightly-sunny white-snow clad Monday. . . with six full inches rapidly melting away, as Spring returns. Smile. . . . In advance of next Tuesday’s hearing in the Ms. L. federal undocumented families’ class action settlement, the able Judge Sabaw has received a new status report, from the parties, as of last night. The ACLU for its part forcefully contests the Trump claim that it may take the government two full years to find as many as 47,000 additional children who were not identified as class members when the October 2018 settlement was signed. At that time there were potentially about 4,200 class members known (as likely entitled to relief), but not yet processed.
. . . .Plaintiffs’ Position: On April 5, the government submitted its plan to identify the pre-June 26 separated families referenced in the internal HHS report. The plan gives the government up to two years to identify the families. . . . Plaintiffs believe that is unacceptable and that the families can be identified much more quickly. In advance of the upcoming hearing next week, Plaintiffs intend to submit specific reasons why the government does not need two years and how the identification process can be completed in far less time. . . .
Do go read the entire 18 page status report — I’m out of pocket for the rest of the weekend. Smile. 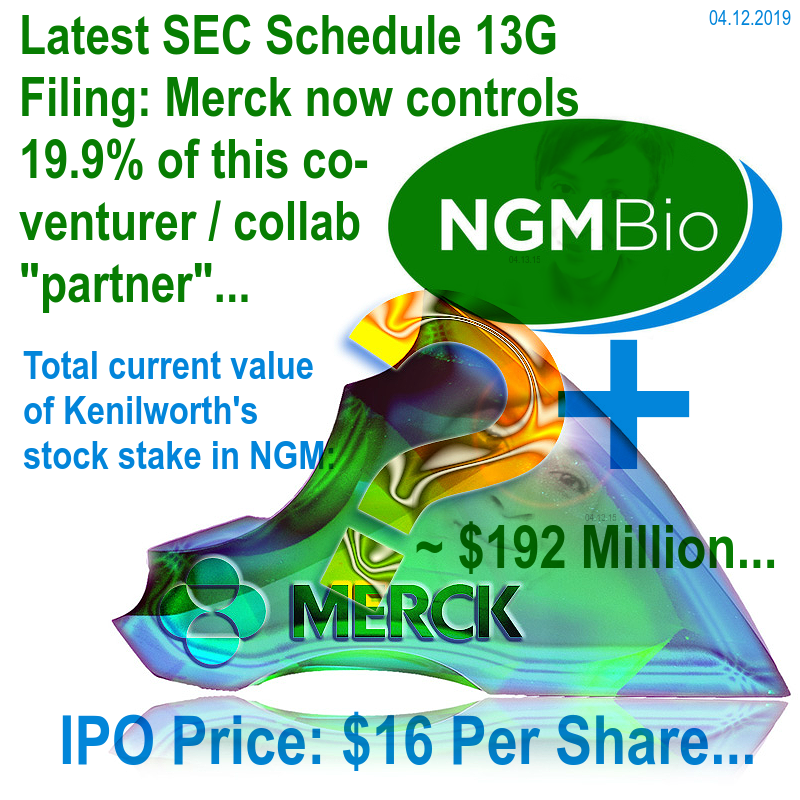 Back to my “power alley” fare, then: at the end of January, we mentioned Merck’s collaborative NASH-aimed stake in NGM.
. . . .On April 8, 2019, NGM Biopharmaceuticals, Inc. (the “Company”) issued and sold 4,121,683 shares (the “Private Placement Shares”) of the Company’s common stock, par value $0.001 per share (the “Common Stock”), to Merck Sharp & Dohme Corp. (“Merck”) in a private placement that occurred concurrently with the closing of the Company’s initial public offering (the “IPO”) of its Common Stock. The aggregate cash purchase price of the Private Placement Shares was $65.9 million, representing a per share price of $16.00, the same price at which shares of Common Stock were sold to the public in the IPO. The sale and issuance by the Company of the Private Placement Shares to Merck were not registered under the Securities Act of 1933, as amended (the “Securities Act”) or any state securities laws. The Company has relied on the exemption from the registration requirements of the Securities Act by virtue of Section 4(a)(2) thereof and the rules and regulations promulgated thereunder relating to transactions not involving any public offering. . . . So. . . Merck plainly believes in this company — and its promise, in the diabetes space. Onward, to a sunny warm weekend away, after a pro bono bond hearing for another undocumented refugee client. . . .